Teresa Kay-Aba Kennedy is a Harvard-trained Strategist, Life Coach, Yoga & Meditation Teacher, Speaker/Moderator and Award-Winning Author. Over the last 15 years, after leaving an accomplished media career, Terri has helped thousands across the globe de-stress and craft authentic success and has served as a personal and business strategist for executives and entrepreneurs. Called “smart with a heart,” she has been featured on the cover of Yoga Journal, in Oprah’s book, Live Your Best Life!, and was selected as a World Economic Forum Young Global Leader recognizing her “professional accomplishments, commitment to society and potential for shaping the future of the world.” From inspiring women in Chile for the Estée Lauder Global Breast Cancer Campaign to teaching yoga to global leaders on The Great Wall of China, she uses her multidisciplinary background for greatest impact. As President of Power Living Enterprises, she advises companies and top executives through strategy sessions, and inspires and empowers individuals through speaking events, coaching, yoga/meditation, media and writing/producing. Her weekly Dose of Power Living goes out every Monday to loyal readers around the world, and she operates the empowerment platform www.iampowerliving.com and e-commerce platform www.powerlivingmedia.com. As a strategist/coach, she has thousands of client-hours and has led hundreds of programs for a range of entities from Bloomberg Media to Deloitte Financial Advisory Services. She has been a C-suite advisor to legendary leaders in various industries and has participated in the exclusive World Economic Forum events in Brazil, China, India, Jordan, Mexico, Morocco, Myanmar, South Africa and Tanzania, including being a discussion leader for the Annual Meeting in Davos, Switzerland and being in working strategy sessions with multinational CEOs and Presidents of countries. An Internet evangelist and intrapreneur, she founded VH1 Interactive and the VH1@Work radio network in the early 1990s, and created pioneering ways of integrating online and on-air (now standard practice) with superstars such as Michael Jackson, Garth Brooks and Paul McCartney. As Vice President of Business Development & Operations for MTV Networks, she managed a 200-person team, negotiated multimillion dollar landmark deals, and planned/launched “The Suite” of six digital cable channels. At 20 years old, she was recruited from Wellesley College to write case studies on Fortune 500 companies for Harvard Business School. Having grown up with yoga and holistic health since she was four years old, Terri is an internationally-recognized yoga and meditation teacher, and long-standing advocate for health & sustainability and the empowerment of women & girls. She incorporates mindfulness into most of her programs and has shared her knowledge in a range of settings from the Sustainability Leadership and Inspiration Academy at the Faculty of Economics at the University (FELU) of Ljubljana in Slovenia to presenting “The Gandhi Effect” program on personal transformation, leadership and social change to a standing room only audience at the Newark Peace Education Summit which headlined His Holiness the 14th Dalai Lama. In 2002, she founded the first yoga studio in Harlem and served six years on the Board of Yoga Alliance, including Interim CEO and their first African-American chair of the Board. She is a National Spokesperson for the American Heart Association, and has served on their International Stroke Committee, New York State Advocacy Committee, Multicultural Leadership Committee, Harlem Go Red Committee and Social Media Subcommittee. She has also served as an Ambassador for HealthCorps. In 2011, yoga master Tao Porchon-Lynch asked Terri and her mother–Columbia University-trained journalist Janie Sykes Kennedy–to help write her autobiography. In addition to being named Oldest Yoga Teacher by Guinness World Records in 2012 and wowing judges dancing with her 26-year-old partner on America’s Got Talent in June 2015, Tao marched with Mahatma Gandhi, helped Jews escape the Nazis as a French Resistance fighter in World War II, modeled for top couture designers, was an actress under contract with MGM in Hollywood, among other things. At 97 years young, Tao seems to have boundless vitality and shows us all what is possible with a lifetime of conscious living. A Hardcover edition of Dancing Light: The Spiritual Side of Being Through the Eyes of a Modern Yoga Master was released in September 2015 and received endorsements from a number of notables such as Rodney Yee, Colleen Saidman Yee, Dr. Suzanne Steinbaum and Agapi Stassinopoulos. Dr. Deepak Chopra said, Tao is “a mentor to me… one of the most acclaimed yoga teachers of our century…she teaches us to have exquisite awareness in every moment.” The Dancing Light book has won multiple awards including a 2016 IPPY Award in the Autobiography/Memoir II category and 2016 International Book Awards in three categories including Autobiography/Memoir, Spirituality: Inspirational, and Best Cover Design: Non-Fiction. For the last four years, Terri has been traveling with Tao–as far away as Montenegro and Dubai–moderating “Conversation with a Master” events, assisting in yoga workshops and documenting their journey. Along with her mother, she is working on capturing more of Tao’s teachings and inspiration in various forms for the world to enjoy. Always seeking to learn, Terri has multiple certifications (coaching, yoga, fitness, holistic health counseling, lifestyle & weight management) and a world-class education–Wellesley College, Harvard Business School, Harvard Kennedy School of Government, Yale University Jackson Institute for Global Affairs and Lee Kuan Yew School of Public Policy in Singapore. She has received a wide range of awards and recognition including Sweet Success (2014) from Women in Business, National Power Award (2009) from the American Heart Association, CUP Fellow (2009) from the Council of Urban Professionals, Women of Brilliant Achievement Award (2008) from Charles & Colvard, Cheerios Sisters Saving Hearts Award (2008) from General Mills and the Congressional Black Caucus, Women Who Dare To Be Different Award (2008) from Congressman Edolphus Towns and The Women’s Caucus, Emerging Entrepreneur (2006) from INC Magazine and the William J. Clinton Foundation, The Network Journal‘s 40-Under-Forty Achievement Award (2004), Teaching for Diversity Program Award (2004) from the Kripalu Yoga Teachers Association and the Tides Foundation and Emerging Entrepreneur (2002) from the Social Venture Network. Author of four books, she contributes to various blogs such as The Huffington Post, the World Economic Forum, Impatient Optimists (Gates Foundation), and Speaking of Women’s Health (Cleveland Clinic). Although she is American, she was born in Ghana, started school in Australia and studied design in Italy. She loves traveling the globe with a “real” camera in hand and has been on all continents except for Antarctica. 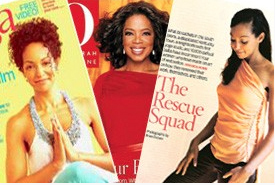 Learn more about her speaking events, strategy sessions, coaching, yoga/meditation, media and writing/producing. 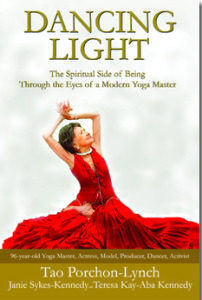 You can also book an event with both Terri and 97-year-old yoga master Tao Porchon-Lynch. Find out more here. We’re moving toward a New World… a world where POWER is not defined by how much control you have over others, but how much control you have over your Self. It’s not about how many things you acquire. It’s about how many people you inspire. Join me in spreading good in the world!